The Sorvall RC-5C Plus Superspeed Centrifuge is designed to separate substances of varying densities at a controlled temperature range. Using state-of-the-art centrifugation technology, the RC-5C Plus offers superior functionality, durability, and simplicity of operation. Its strategic combination of outstanding features guarantees high quality intensive separations in the minimum amount of time possible. Equipped with a Relative Centrifugal Force (RCF) calculator, the RC-5C Plus allows the user to calculate the RCF before a run, and display it anytime during the run period. 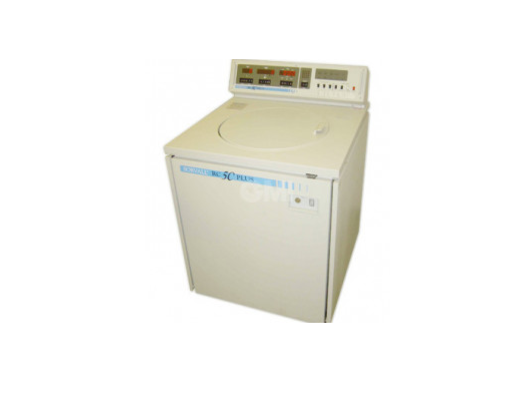 This Sorvall centrifuge employs an integrator that can be used as a control or as a display, or even both. The RC-5C Plus system also makes use of a refrigeration system powered by SUVA® refrigerant—a Kendro-manufactured CFC-replacement coolant. Additionally, the system employs an automatic temperature compensation system and an automatic rate-controlled slow start and slow stop. Run conditions on the Sorvall RC-5C Plus centrifuge are selected using the front control panel, while actual run conditions are shown in real-time by easy-to-read displays. To avoid centrifuge malfunction, the built-in microcomputer automatically performs self-test routines once the centrifuge is started.